Trustworthy. Evinco Software are digitally signed. We are pleased to announce that our software are now digitally signed. Our signed software ensures that you can verify the origin of the software, as well as verify that no one has tampered with it. If the software is tampered with in any way, the digital signature will break. It will alert you that the code has been altered and is not trustworthy. 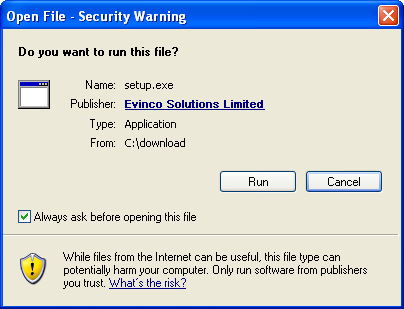 How to verify the Evinco Software? When you run the installation file (setup.exe), the following Windows is popup. The name of the publisher should be Evinco Solutions Limited. When you click on it, you can review the Digital Certificate. You can check the "Issued to" and the Date of the certificate. 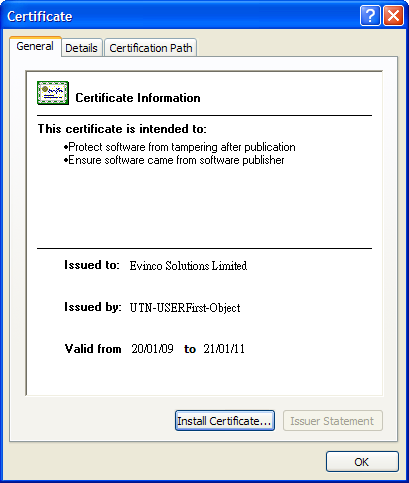 By verifying the certificate, you don't need to worry about the software is tampered by the hacker/virus. You can benefit from this software accountability because the software are published from Evinco Solutions Limited and that the code has not been tampered with.